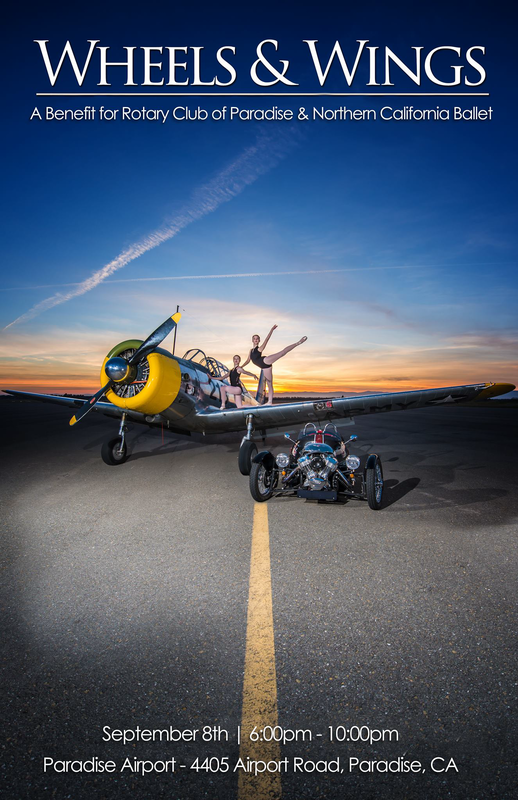 Save the Date for this amazing event by the Rotary Club of Paradise featuring modern and classic airplanes and automobiles, beautiful ballerinas, and of course fine food, beverages, music and dancing all at our beautiful Paradise Airport. 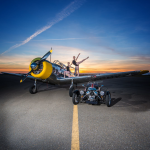 Come view the Sutter Buttes and the excellent static displays while supporting the Rotary Club of Paradise’s philanthropic efforts to make our local community and world a better place for all. September 8th, 6-10pm. Have a classic car you would to like to show. 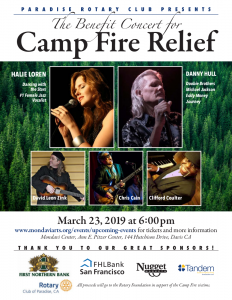 Click here for entry form and details. 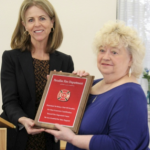 The Paradise Rotary Club received a special plaque at the recent ceremony dedicating the town’s new fire engine. 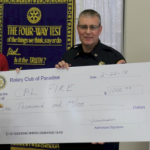 Past Rotary President Trudi Angel, was beckoned to come forward to receive recognition for the donation of $20,000 for the purchase of the self contained breathing apparatus (SCBA’s) last year during her presidency. 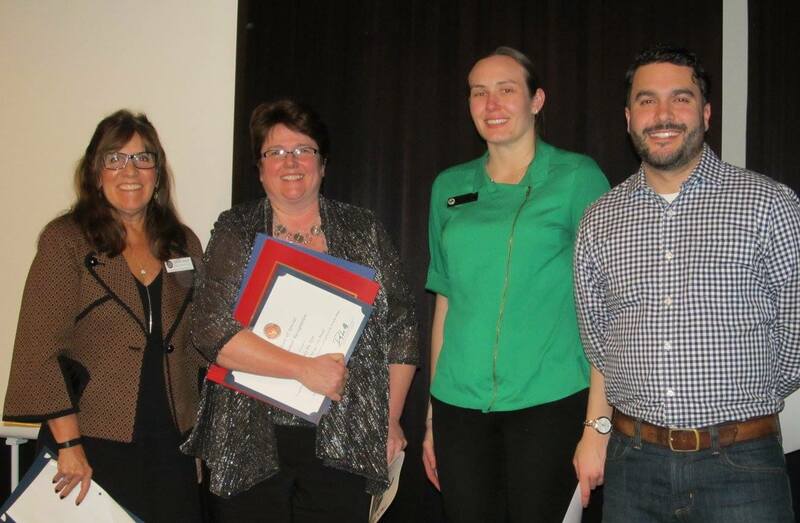 The recognition was presented by town manager and current Rotary President Lauren Gill. Trudi thanked everyone who helped with the project through fund raising and promotion. Rotary District 5160 grant project 2017. 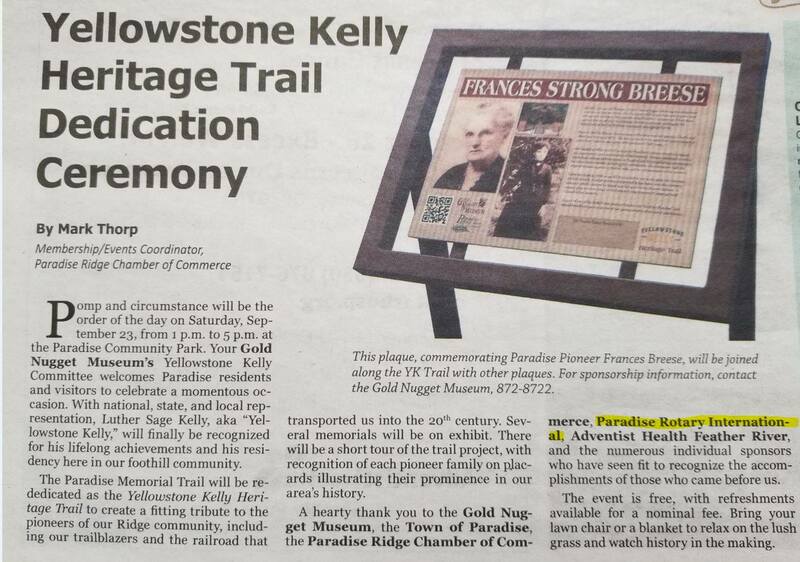 The Rotary Club of Paradise donates $25,000 to the Gold Nugget Museum for the Yellowstone Kelly Heritage Trail project. 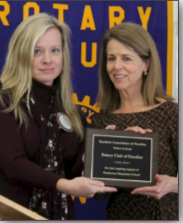 Paradise Rotary Club President Lauren Gill and Past President Dana Gajda shown here with a plaque from the Teachers Association of Paradise(TAP). It thanks our Club for the Annual Mini-Grants and funding the creation of the Rotary Ponderosa Elementary STEAM lab. 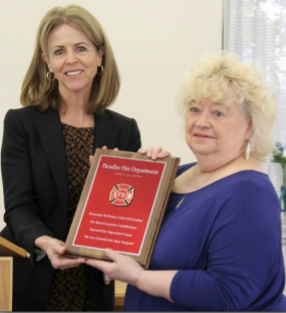 The plaque was presented by Amy Keene, Kindergarten teacher at Paradise Elementary School. Amy and her fellow teacher Zina Bonham had just received a check from the Club’s Foundation for $1200 as a mini grant for their classrooms. President Lauren bestowed the plaque to Dana G., since the STEAM Lab project came to fruition during her year as Club President. 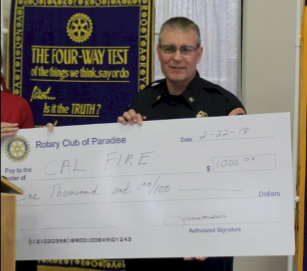 Paradise Rotary Club Donates $1000 to the Fire Safe Council to help update and reprint the Ready, Set, Go Evacuation Plan and Emergency Fire Zone Maps. The check was presented by Rotary President and Town Manager Lauren Gill. 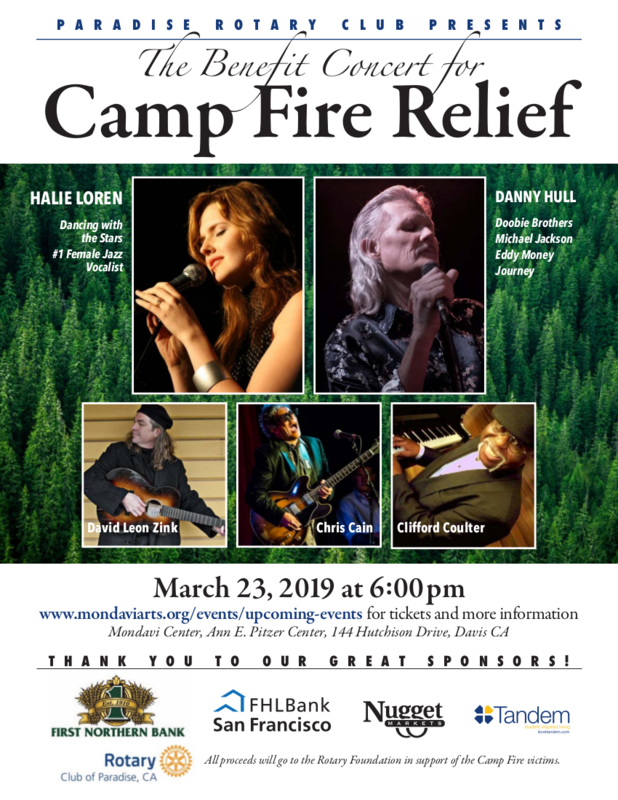 Shown here is Chief Hawks, Cal Fire Chief. 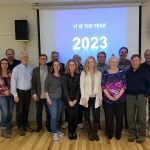 According to Phil John, Paradise Rotarian and Fire Safe Council Chair “There have been only minor changes, but the big ambition is to mail these documents to every resident of Paradise and Magalia”. According to Chief Hawks, they are very close to that goal. He thanked the Club for making a serious contribution toward that end ($1000). PG&E also contributed a sizable donation to Butte County wild ﬁre preparedness projects. Chief Hawks says, “The most important thing you can do is to [actually] read the plan.” He says do this before there is smoke in the air. Another great update is an addition to the map. 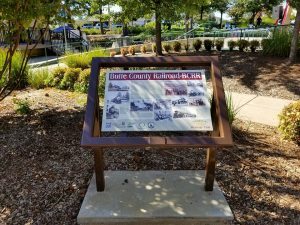 It will be a URL for computer or smart phone that takes you to a page with a tool that identiﬁes evacuation zones based on starting address. Click on the function, enter an address and the evacuation route will be shown. The new Ready, Set, Go Evacuation Plan and Emergency Fire Zone Maps will be mailed in May. Chief Hawks says he wants to wait until people start thinking about FIRE rather than FREEZING! 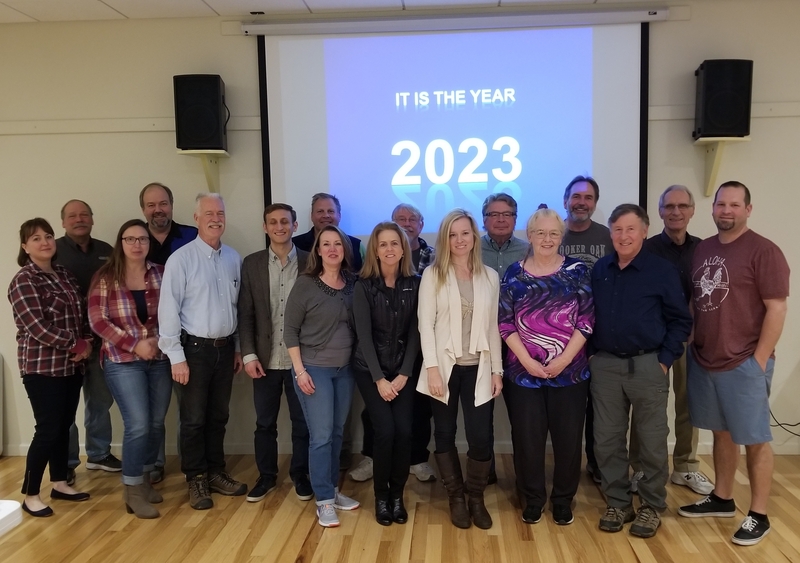 Paradise Rotarians spend their Saturday developing a vision of what our club will look like in the year 2023. Tina McNeil is the newest member of the Rotary Club of Paradise. She was inducted at last weeks meeting by club President and Paradise Town Manager, Lauren Gill. Tina is a loan officer with Big Valley Mortgage here in Paradise. 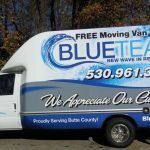 Her office is right next to Cindy Haskett’s Blue Team Realty office on Center Street. 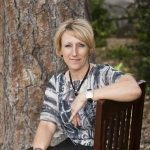 Tina is a longtime resident of Paradise and has been in the mortgage business for over 10 years. Tina and her husband Matt have three children and 4 grandchildren and enjoy camping, traveling, and Geezing (your’ll have to ask her about Geezing). 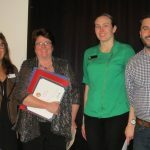 Congratulations to Tina and Matt on becoming Paradise Rotarian’s where Service Above Self to our community and world is our goal..
Heidi Elick of Prosperity Investment Management Inc. was welcomed in the Rotary Club of Paradise at our March 1st, 2018 meeting by Club President and Town Manager Lauren Gill. 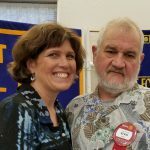 Heidi is a perfect fit for our Rotary Club. She has been a long time “Friend of Rotary” serving as co-chair of the Club’s very successful Relay for Life fund raising campaigns and more recently co-chairing the Crab Feed seating committee with Mary Bellefeuille. 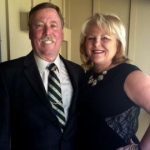 She is married to Truman Elick and enjoys riding horses, family time and volunteering her time and money for local causes and organizations such as Paradise Rotary. The next time you see Heidi let her know just how much you appreciate her “Service Above Self” to her community and world. Kevin Kelly, Long time resident and retired AT&T Technician was inducted into the Rotary Club of Paradise at our January 4th meeting. Shown here with Margaret his bride of 38 years, they have two children and 5 grandchildren. Margaret is the Nutrition Services Director at Feather River Hospital. Kevin has always been active in our community coaching sports, driving school buses and so much more. 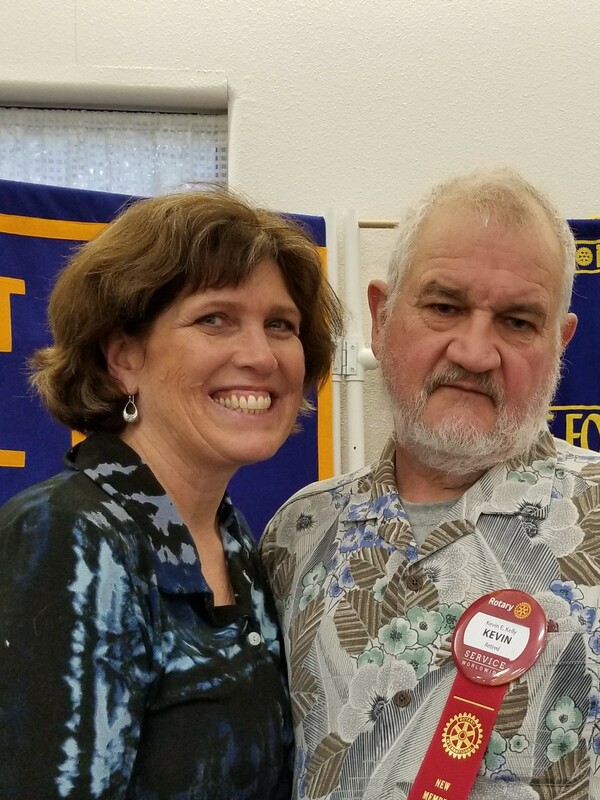 Kevin has participated in numerous Rotary activities and fund raisers so it was a natural fit for his membership in our Rotary Club. 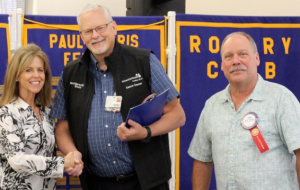 We welcome Kevin and Margaret into our world wide Rotary Community..
Kevin Fullerton, Director at the Feather River Hospital Cancer Center shown above with Paradise Rotary President Lauren Gill and Kevin’s sponsor Steve Crowder co-owner of A Stitch Above Embroidery was inducted into the club at November 2, 2017 meeting. Kevin has lived his life serving his fellow man as a surgical nurse and nurse manager. This service makes him a perfect fit for membership in Rotary whose motto is “Service Above Self”. Kevin and his wife Jackie, also a nurse at Feather River Hospital enjoy motorcycling , church activities and Kevin is a volunteer for the Butte County Sheriff Communication Reserve.